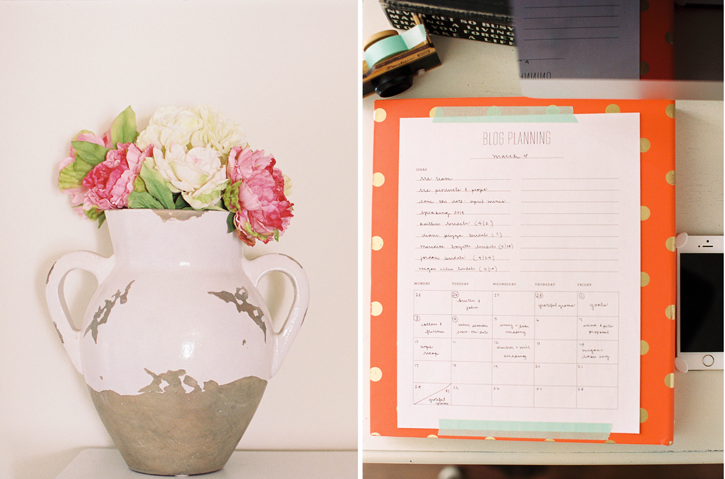 Be sure to read Part 1 of How I stay Organized in my work if you missed it! 7. Clean up and organize equipment immediately. This is a vital habit to create in the middle of wedding season. After a wedding or session, the first thing I do the next morning is clean up all the equipment, recharge the batteries, wipe the lenses, and mail off the film, and put everything away in the closet. If I have a shoot that evening, I’ll lay out my bags and equipment in the hallway for me to grab as I walk out the door – complete with CF cards, film, and charged batteries. Keeping equipment ready to “grab and go” is key to staying organized and prepared. 8. Checkbook, stamps, and stationery. On my desk, I have a little caddy from Pottery Barn where I keep my checkbook, my stamps, and some stationery. I also keep my favorite pens, Chapstick, lotion, and post it notes in my desk drawer. Having these little things available at my fingertips makes it easy to send a note or check, to write myself a reminder. 2. I draft 3-5 blogposts and schedule them. Once I schedule them, I circle the date number so I know they will automatically post that day. When I plan my next month (May) of blogging, I immediately know that I need to write in those posts on those days first! I’ll transfer “Whitney Graham Bridal (6/9)” to the line on my May blogging, so I’ll know to write that in my June blogging worksheet immediately. 4. I give myself grace! Sometimes I switch dates around. Sometimes I get inspired and want to blog about life, so I’ll bump sessions to a different day. Allow for an imperfect schedule, because that’s life. Would you like your own Em for Marvelous Blog Planning download? 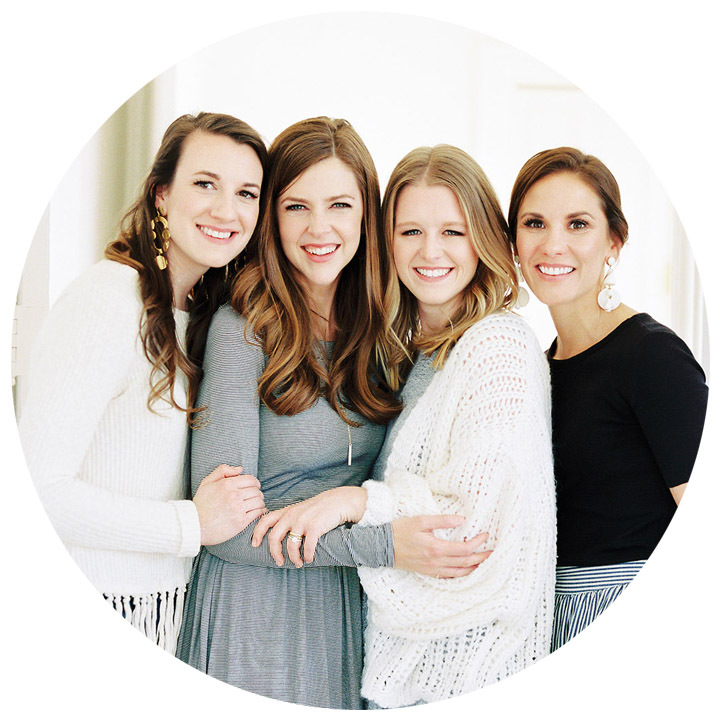 Read this post on her blog and scroll to the bottom for your very own copy! I love my workflow wall! 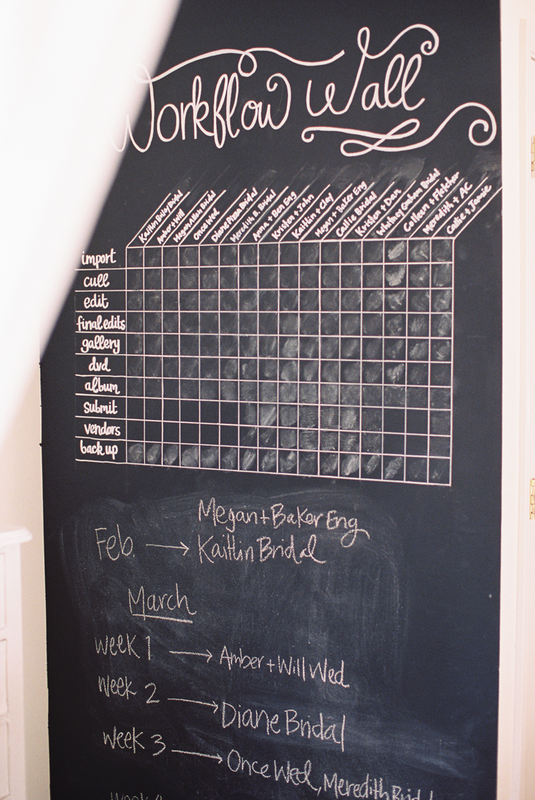 It’s a great way for Callie and I to glance at our progress on a shoot and know how far we have to go. My favorite addition to the workflow wall is the weekly goals we list below. It gives us editing goals each week, and it keeps us on top of things! This is a photo of our workflow wall at the very beginning of this season. Notice that nothing is checked off, and that our weekly goals are listed below. See all the names of couples at the top? Those are our upcoming bridals, engagements, and weddings we will be shooting. There is a lot of work to keep track of! – Blogposts : Every time I think of an idea to blog, I enter into this list. – Clear the Clutter : I’ve listed every area of my life that needs to be decluttered, and I systematically tackle it. Once it’s done, I check it off. – Books : I have a long booklist of recommended readings. Every time I hear of a good book, I enter it on my list! – Callie’s list : Callie and I have a shared list, so every time I need her to do something, I will enter it on her list. She will automatically see it and do it! 1. As soon as a couple books me, we create a folder. We write their first names + their wedding date on the tab. 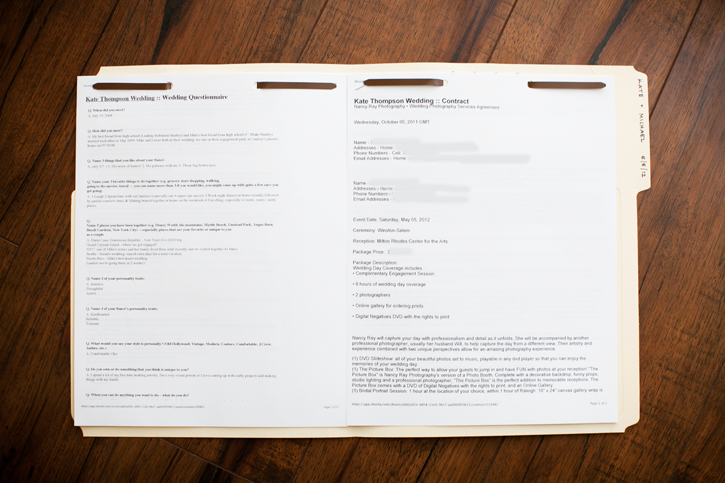 Then, we print their contract, hole punch it, and place it on the right side of the folder. 2. Once we receive their questionnaires that we send through ShootQ, we place them on the left side of the folder. 3. If we receive any invitations or details to photograph during their engagement, we place them inside the folder so we have them ready to go on the wedding day. 4. If the father of the bride emails us asking for a photo of him and his college buddies at the reception, we print it and put it in the folder. If the bride asks us to photograph her handkerchief, we print it and put it in the folder. 5. Last but not least, we discuss the wedding day timeline on the phone with the bride a month before the wedding. At that point, we will print copies and place them in the folder. 6. The day of the wedding, we will read through the folder in detail! We will make sure we know all of their special requests, we’ll write notes on our timelines, we will have their invitations in hand. Everything is in one place. 7. When their images are complete and their albums are in the hands of the client, we will file the folder away. Until then, it stays right beside my desk, within arm’s reach! Do you have any additional questions in how I stay organized in my work? Feel free to leave a comment! Next up: Organization in Time! How lovely! 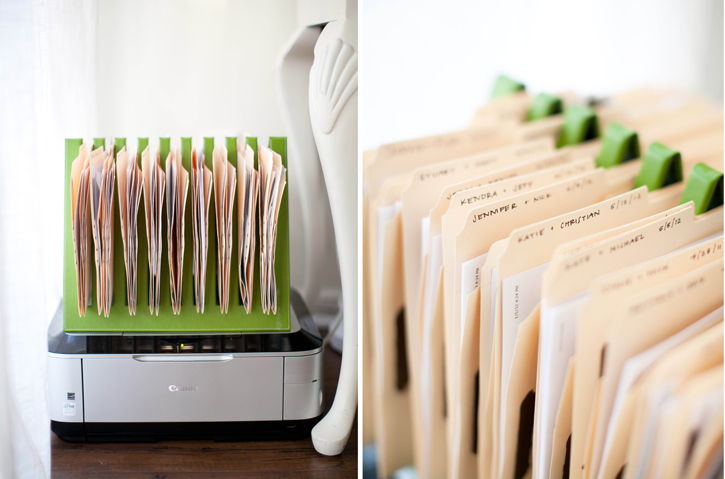 Please share where the file folder organizer is from… I’m in dire need! It’s from Crate and Barrel. It’s been a long time since I’ve purchased it though, so I’m not sure they carry it any more! Loving this series! I would love to know your organizational system for your film negatives. Thanks! I would love to know where that file folder organizer is from. Love it! More fantastic ideas, thank you Nancy. I’m loving this series, and certainly cannot wait for the next post on organising time. I like point one about cleaning everything immediately and packing away — good advice to translate to my kitchen! (The washing up can built a little). Those folders sound fabulous! I love how intentional you are about creating a system that makes it easy for you to maximize the client experience – keeping all those special requests together must be so helpful! Love that file organizer! I’ve been looking for something like that – small but still gives you lots of organization space!